This is the document being discussed. The first sign of "enforcement" by Fr. Paul, after the Neos' failure to produce a document supporting their (to be kind) "different" way of receiving Communion is for Fr. Paul to cancel the Neos activities on Church grounds such as, but not limited to, their Invitation to Joy seminars and their separately scheduled Mass. 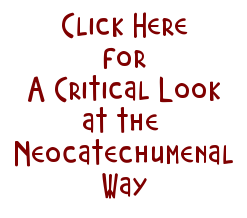 Also, the priests celebrating the Neo masses must be set straight about following the GIRM. Call to Joy at local hotel! Yes! An appropriate day to send a love letter to his parish. love letters have been sent to the ncw in the past, the ncw tripped over themselves following those suggestions, yet here we still are, being even more polite/pc even. the two catholic world knows the ncw does not obey anyone higher than a kiko, nor do they obey anyone lower than a pius. the diana will claim the ncw is at the service of the bishop, and not the rector, so till apuron says otherwise, the ncw will continue to do as they please, besides they believe in byrnes not taking sides. Thus Byrnes will have to take sides or he has no business as bishop. When the Neos have their Saturday celebrations,does that fulfill their Sabbath obligation? I thought that as One Holy Catholic Church we celebrate as a parish and not have a separate one for a "community" to take the place of the Sunday obligation. I know some go to their Saturday community celebration and not to their parish mass with everyone. This I find disturbing and is where some community members are being separated from the rest of the parishioners creating division. ..possibly to control their members. It's to the point where a member has to consult their community when there is a family emergency as to whether they should miss their retreat. I find it disturbing as if the member needs permission. I have witnessed this first hand. Father Paul (I think) was trying to be not just polite but “politically correct” as well, in addressing his Valentine letter to include a whole bunch of recipients, including the Neocatechumenal Way. His letter could just as well have been a direct letter to the Neocatechumenal community in his parish (Cathedral), with cc copies to the other recipients – for their information and guidance. 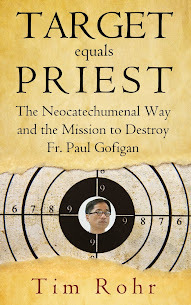 In my reading, that’s the way I see the letter – and I greatly commend Father Paul for his staunch position in addressing the problem of the Neo aberrations in his parish, especially theological and liturgical aberrations, and his desire to cleanse his church of heresy. This is the Father Paul I know when I first read about the staunch position he took years ago while he was pastor of Santa Barbara Church in Dededo when he was approached by NCW reps to establish NCW communities there. Kindly and firmly, he told them then that he might give his permission to do so, on condition that their practices in his parish conform to the rubrics of the Holy Mother Church as laid out in GIRM. Notwithstanding the banging on the table by “the tall lady” in disgust over Fr. Paul’s carte blanche disapproval, Father Paul stood his ground. And as we discovered later, it was the real reason why he got booted out of the parish by Archbishop Apuron, and told to go look for another bishop who may be willing to incardinate him. The rest of the story is history – only too well known by many. We so greatly admired Father Paul for his brave action then, and I – for one – am praying that he stand firm in this present position now – and not buckle up under pressure -- which you are sure to get, Father Paul. A less polite (and perhaps less politically correct) closing of his letter to the Neos would have been: “Shape up, or ship out!. Conform to Catholic teachings and rubrics, or get out of my parish!” You do have the authority to inhibit the proliferation of the NCW in your Cathedral Parish, Father Paul. It is my belief that you do not need the permission of Archbishop Byrnes on this. You, as pastor of your church there, have the unilateral right (and duty) to cleanse your parish of heretical beliefs and practices. You’re the boss there! Good luck – and lots and lots of prayers for you and your Agana parishioners. STAND STRONG IN THE FAITH – FORTES IN FIDE! Why did Fr. Paul allow the Neos to advertise their "Invitation to Joy" during his Masses? God Bless You Fr. Paul for insisting that we all conform to the approved liturgy of the Church, mandated by the church herself to protect the sacredness of this greatest treasure, the Holy Sacrifice of the Mass. Regarding the catechesis that is happening at the Cathedral, does that mean all cathesis inclusive of what other groups are teaching the faithful, including the NCW catechesis? Hope this is the intent. I would say that the church has to insist on the communicant receiving the Body of Christ immediately to prevent any possible desecration of Christ's body, by anyone who is not intent on receiving this sacrament with good purpose. Who is to say that if the communicant are allowed to take the body of Christ to the pew, or delay reception that their intention is not to desecrate it. One of the ways that we can prevent this is to insist that the Body of Christ be received immediately in the presence of the Priest or extra ordinary minister of Holy Communication. We now have a de facto two speed situation in our Archdiocese. The Cathedral, and I hope many other parishes will follow the GIRM. Which they should have always done. Since Archbishop Byrnes, has failed to enact such policy at the Diocesan level, as I advocated he did, we now shall have parishes were things are "kosher" if you excuse the pun, and others which will follow the heretical teachings and practices of Kiko, and his henchman on Island: Pius the Putrid Monk. We are therefore continuing to have parishes who are held hostages to the Neocatecumenates, and others where the heretics will continue their campaign of divide and conquer. For the person who made the anonymous allegation about Mr. Sotto. I don't publish allegations from anonymous people. Send me an email with your name and your contact information and the allegation at junglewatch.info@gmail.com This is what I required John Toves to do. Up till then I had received many allegations about Apuron and others. However, I didn't publish them. Mr. Toves was the first to be willing to attach his name to his allegations. Let's see if you will do the same. good on fr paul for doing this. it's a firm step in the right direction. God bless you, fr paul. fr paul mentions abiding by the general instruction of the roman missal (girm). this is a great opportunity, especially as lent begins, for everyone--not just the neocats--to read and study the girm, especially in groups. i hope that by doing so, people will have a renewed and greater love of what the Church celebrates during the Sacred Triduum, beginning with the memorial of the Institution of the Eucharist on Holy Thursday. If Byrnes refuses to comply with the GIRM and protect the Mass from raving heretics, he's in league with the Neocats. Actions speak louder than words. Perhaps you need a second Cathedral picket line demanding Byrnes' removal. There is no excuse for him silently allowing desecration of your churches. It's about time Fr. Paul stepped up. Tuesday was the deadline for submission of permission. Any udpate on this.